but not on server farm capacity or availability. Usually, this type of architecture suits well when you have two datacenters or more, over a MAN or WAN. But it can be used in a single DC as well, over the LAN. Principle is quite simple: building a BGP Autonomous System (aka AS) where the ALOHAs can inject routes into your core routing network. The core routers will be configured to choose an ALOHA if it is available or failover to the second one: this is an Active/Passive infrastructure. The core routers will be configured to send traffic to ALOHA1 and failover to ALOHA2. The BGP AS number is 65000, the routes injected by the ALOHAs are the subnet dedicated to Virtual IPs: 172.16.2.0/24. The Core routers and the ALOHAs can communicate through the subnet 192.168.10.0/24. In the ALOHA, the dynamic routing service name is bird. On the ALOHA WUI, click on Services tab then scroll down and click on the link advanced mode. Click on OK when prompted. Advanced services are printed in red. Click on the edit icon on the bird service line: . Then comment or delete the line no autostart. Now you can start bird by clicking the start icon: . Based on the diagram above, below are the BGP configuration for both ALOHAs. This configuration remains the same, whatever BGP router you are running on the core network. In order to edit bird configuration, just click on the edit icon: in the Services tab. This chapter introduces BGP configuration on different type of equipements. These configurations are basic example and may require some tunning to fit in your environment. The weight (bgp_local_pref) is higher for ALOHA1, so it will be chosen first if it is available. Prefered route is the one with the star * and bird will use it first. From a kernel point of view, only a single route is known. If ALOHA1 fails, then core router’s bird will update the router’s routing table with ALOHA2’s IP for all of Virtual IPs. If ALOHA1 stops annoucing one route, then core router’s bird will update the router’s routing table with ALOHA2’s IP as a destination for this particular Virtual IP. Brocade is one of the leader in the networking industry. Cisco is one of the leader in the networking industry. Cisco routing table is quite verbose: we can see the route weight and the currently selected route. We can clearly see as well that the routes were learnt through iBGP. If ALOHA1 fails, then Cisco router will update its routing table with ALOHA2’s IP for all Virtual IPs. If ALOHA1 stops annoucing one route, then Cisco router will update its routing with ALOHA2’s IP for this particular Virtual IP. create bgp neighbor 192.168.10.1 peer-group "aloha"
configure bgp neighbor 192.168.10.1 description "aloha1"
create bgp neighbor 192.168.10.3 peer-group "aloha"
configure bgp neighbor 192.168.10.3 description "aloha2"
OpenBGPd is the BGP daemon provided with OpenBSD operating system. OpenBGPd routing information base is quite verbose: we can see the route weight (lpref) and the currently selected route. We can clearly see as well that the route were learnt through iBGP. 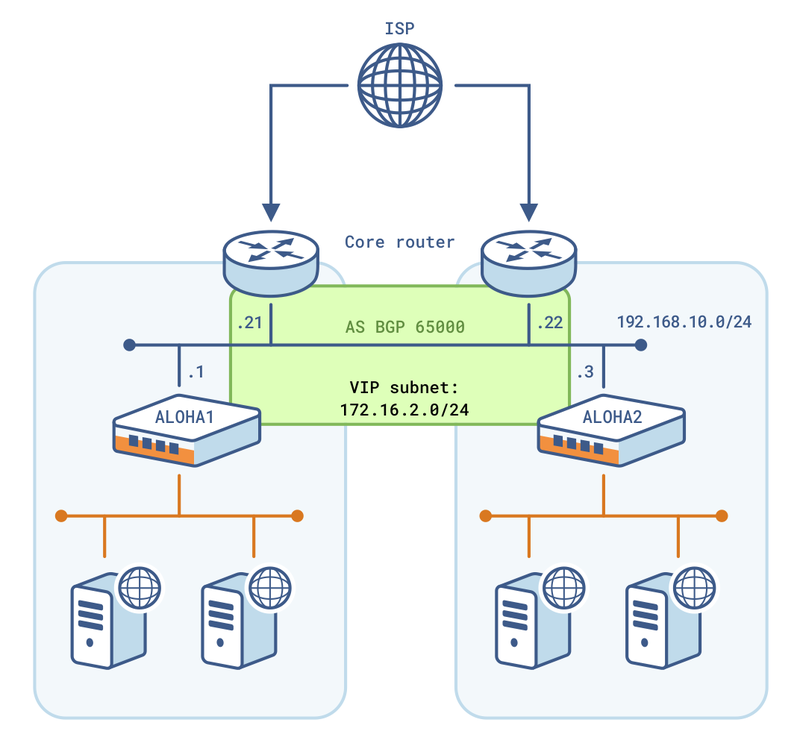 If ALOHA1 fails, then OpenBGPd will update router’s routing table with ALOHA2’s IP for all of Virtual IPs. If ALOHA1 stops annoucing one route, then OpenBGPd will update router’s routing with ALOHA2’s IP for this particular Virtual IP.